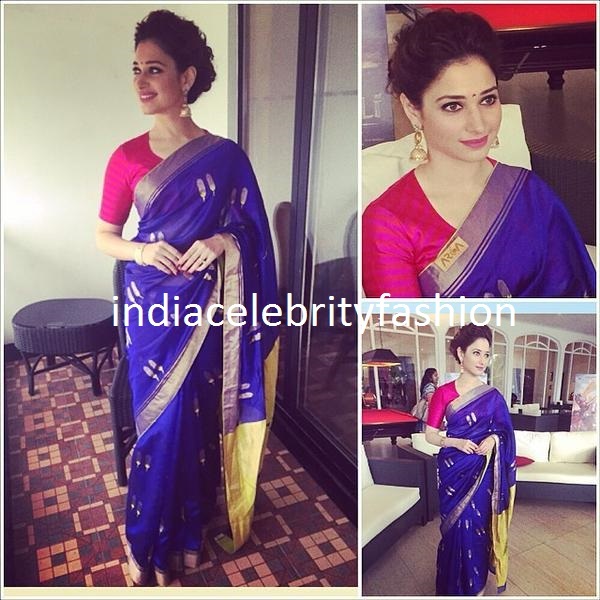 Tamanna bhatia in raw mango saree,puff hair style adorned with umbrella jhumkas at Baahubali malayalam audio launch. South indian actress Nadiya in orange color plain saree with zari border paired with boat neck elbow length raw blouse,blu clutch and blue earrings at filmfare south awards. 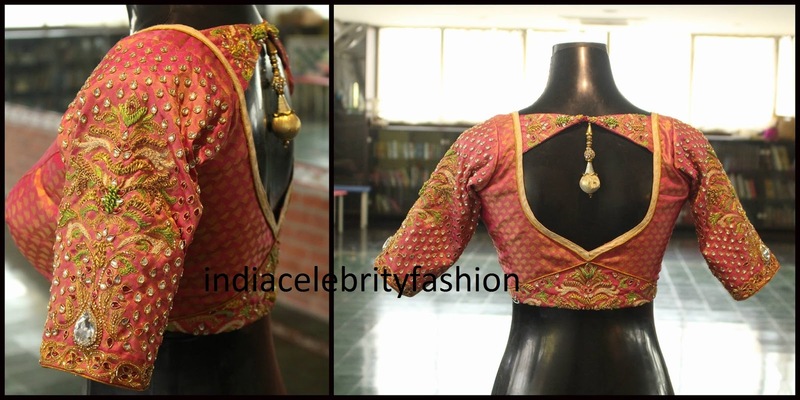 Bridal blouse design embellished in zari and silk with a sprinkle of stones and tassel at back.Perfect fit for bridal silk sarees. Beautiful latest pearl work blouse design. 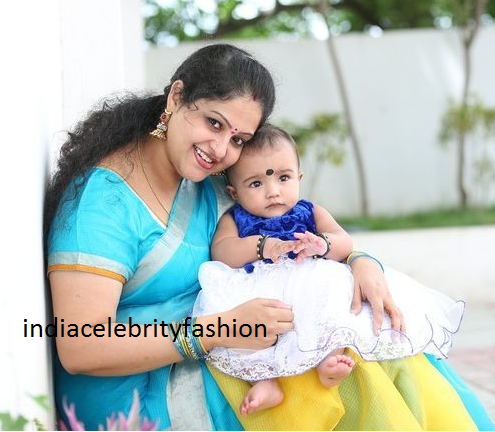 South indian actress raasi daughter Rithima photo gallery.Rithima is in cute frock. Raai laxmi in one shoulder pleated designer gown compilmented with big jhumkas and upto hair style at south filmfare awards 2015. 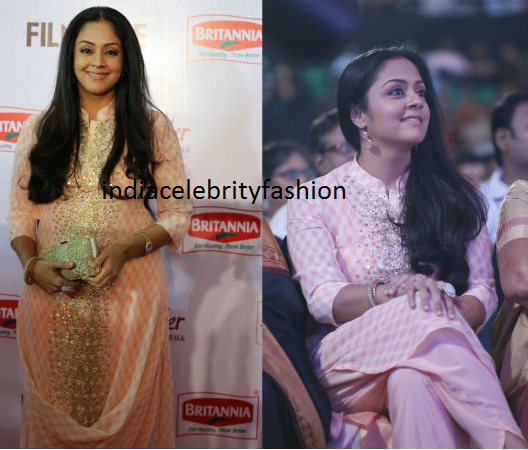 Actress Jyothika Surya in light orange and white color collar neck half sleeve salwar kameez paired with pearl bangle and gold color shimmering clutch at film fare awards south. Lakshmi Prasanna manchu in Shantanu and Nikhil designer cream color sleeveless long gown adorned with emerald diamond earrings at filmfare south awards 2015. 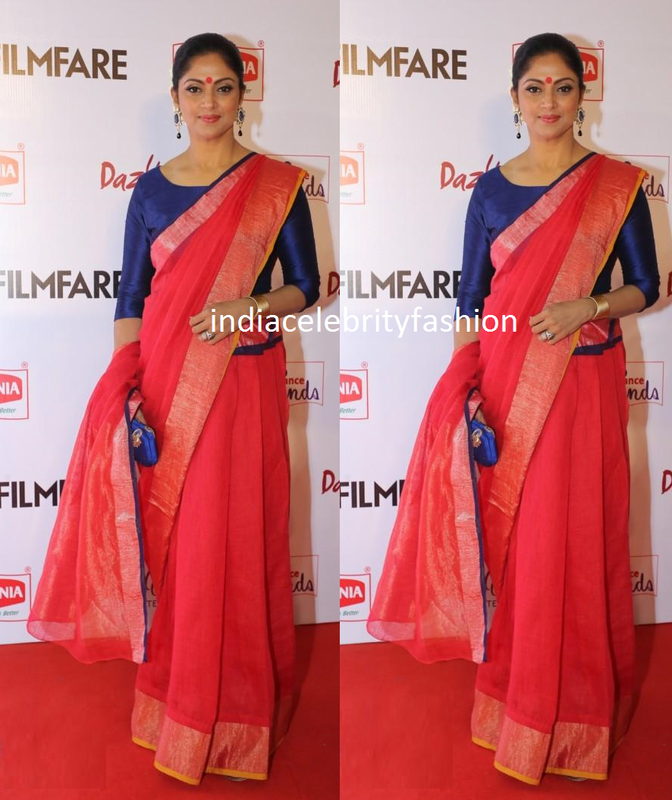 Tamil actress Radhika sarathkumar in shaded green and blue kamjeevaram silk saree adorned with diamond pendant necklace at filmfare south awards 2015. Rakul preet in gauri and nainika designer brown long gown at britannia filmfare south awards.She used studiotara jewellery and styled by Neerajakona. Hansika motwani in designer light blue and black color saree with curiocottage jewellery at Uyire Uyire Audio launch. 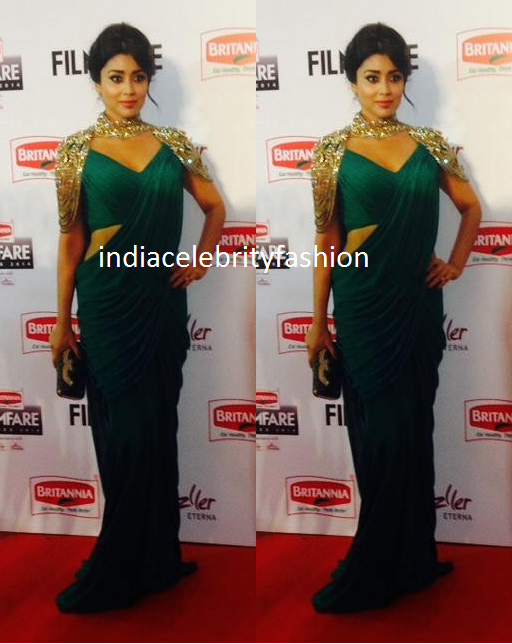 Shriya saran in dark green saree at britannia filmfare awards south 2015. 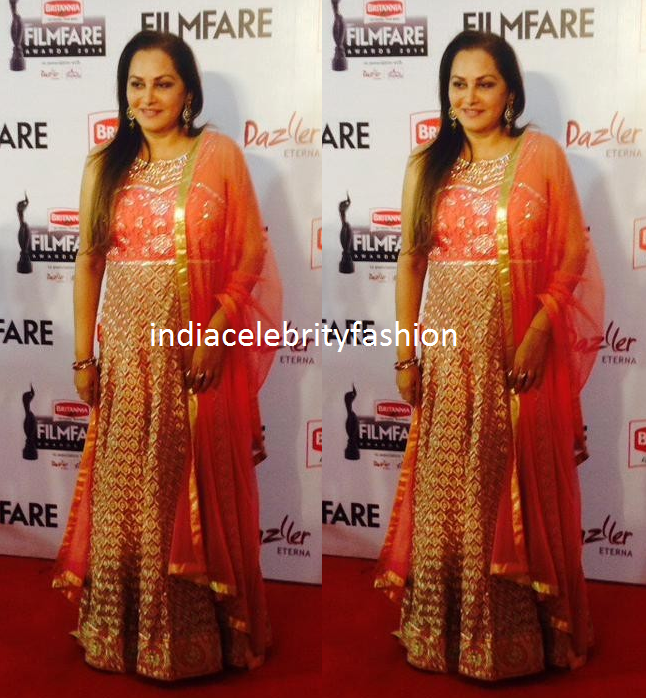 Jayaprada in long sleeveless orange color work Anarkali at britannia filmfare south awards 2015. Bollywood actress Asin in full black apparel.she is in black top,jeans,glasses,half shoes and designer handbag. 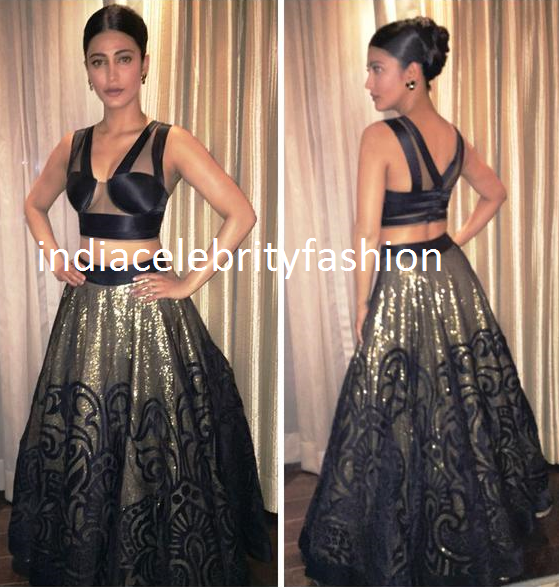 Shruti hassan in organza black dress with high waisted skirt designed by AbuJani and SandeepKhosla Black dress with center parting updo hairstyle.She looked pretty in this dress at britannia filmfare awards south 2015. 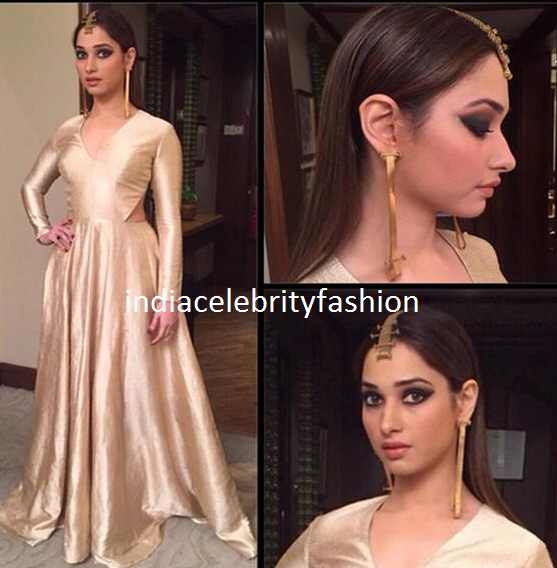 Gorgeous Tamannah bhatia in Nikhil thampi designed long anarkali at Britanni filmfare awards south 2015.Her accessories are designed by Suhanipittie.She looked simple sleek hair style,smokey eyes and light pink lipstick.She looked lovely. Indian actress Kajal Agarwal in designer cream color long gown with halter neck open back designed by SS Surya.Simple hair style and ruby haar complimented her dress.She looked pretty! 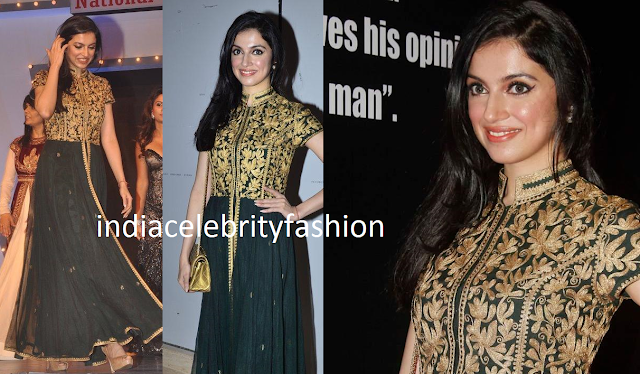 Divya kumar khosla in black and gold floor length collar neck salwar kameez at Medscape awards 2015. 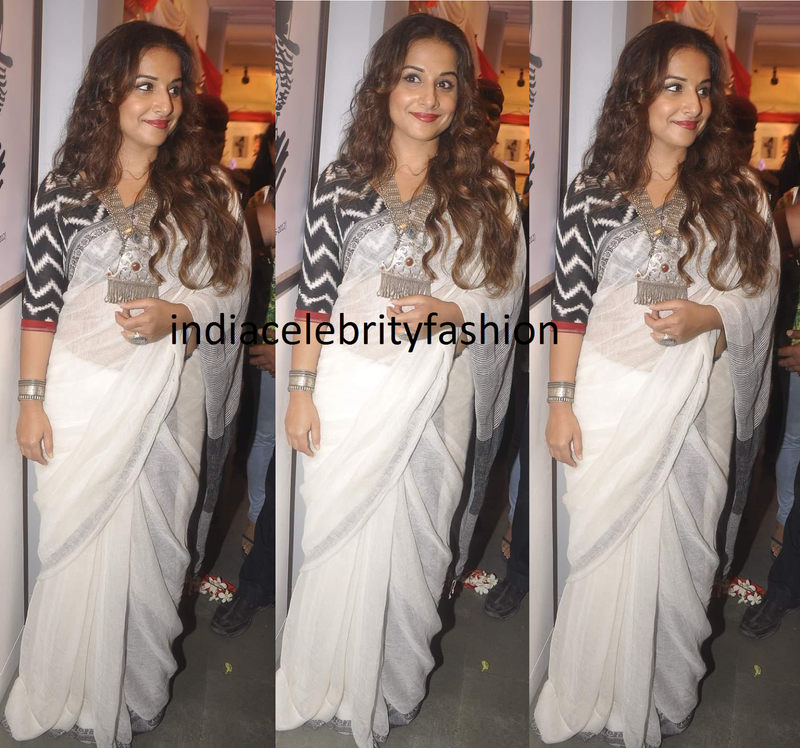 Beautiful Sonakshi sinha appeared in two different styles on the sets of Indian Idol Jr in Mumbai. 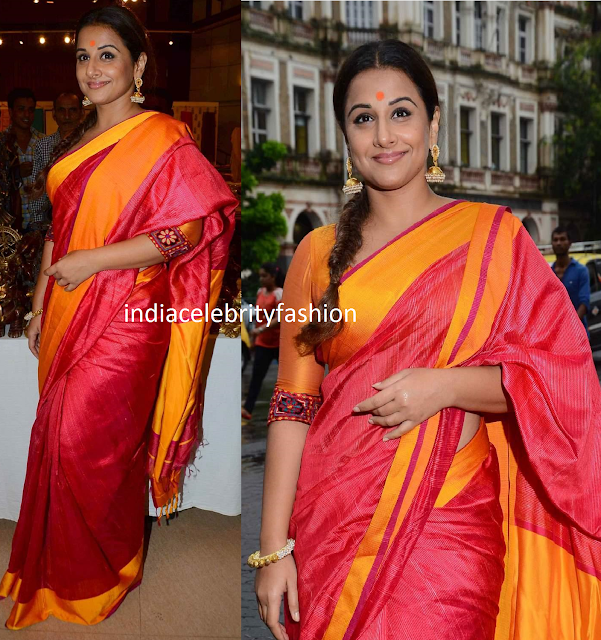 First dress designed by nikhil thampi and lemon yellow lehenga designed by Manish malhotra. Vidya balan in simple white cotton saree with quarter sleeve black and white blouse.Her curly hair style with center parting and amrapali silver jewellery complimented her look.She made this appearance at Charlie chaplin exhibition. 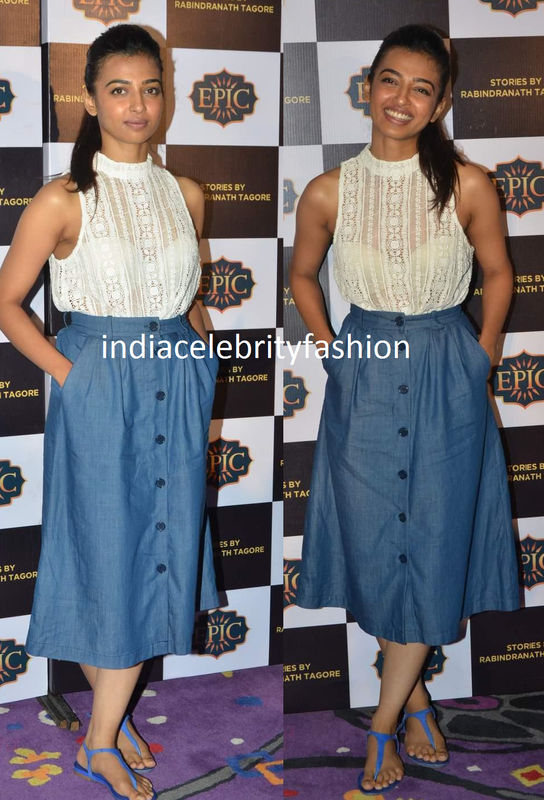 Actress Radhika Apte in white sleeveless lace shirt and blue button model skirt with blue sandals and simple puff hair style at Epic channel screening. Poonam dhillon in party wear green floor length long gown. South indian actress Priyamani in designer red banarasi half and half saree with work border embellished with green designer blouse. Bollywood actress Vidya balan in plain sari with quarter sleeve blouse.Loved her simple center parting hair style,traditional attire with antique jewellery. 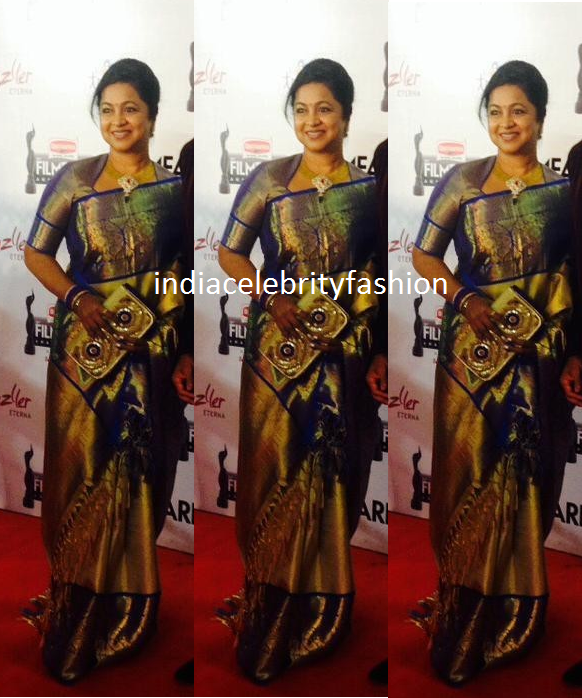 Actress Raasi in simple salwar kameez at Jilla movie audio launch. Actress Sree mukhi in designer peach and yellow shaded netted lehenga half saree embellished with designer netted work blouse. South indian actress Charmee in blue floor length anarkali with collar neck and full sleeves at Jyothilakshmi movie function. 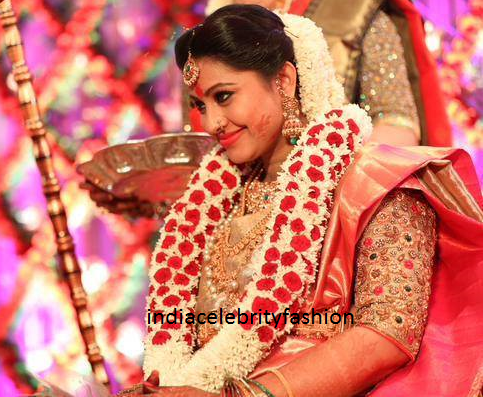 Beautiful Sneha in traditional jewellery and traditional mango zari saree at her baby shower function/seemantham function.Click here for more photos. 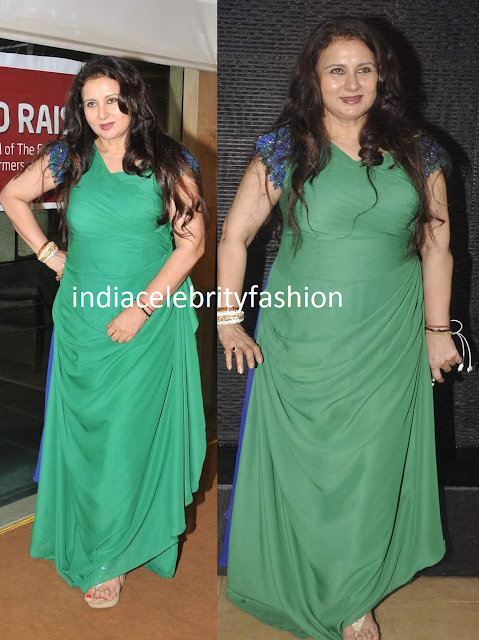 Indian actress Tamanna bhatia in ink blue color Cameronkham dress with puff hairstyle at Body goddess book launch. South indian actress Hansika motwani in western dress with lace work at Promotions of Romeo & Juliet.Loved her Hair style. Actress Adah sharma in white long anarkali with pink dupatta. Actress Gautami in white saree with simple kundan necklace at Papanasam movie press meet.She is along with Kamal Hassan. 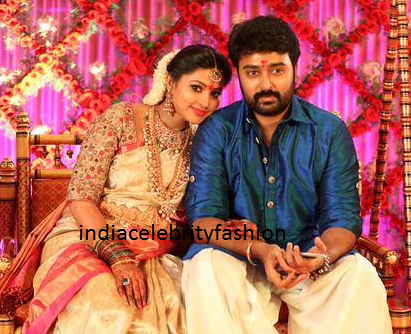 Beautiful Actress Sneha Prasanna's Baby shower function/Seemantham Function photos.